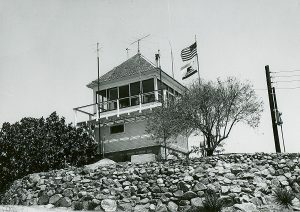 Red Mountain, near the town of Fallbrook in northern San Diego County, has hosted a lookout since 1921. No images exist of the original lookout. 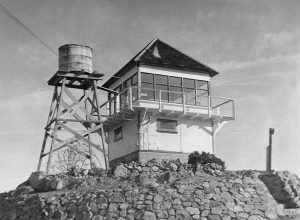 A new lookout structure was built in 1935 along with a garage and weather station. The structure was a CDF design similar to the Forest Service 4AR 14 x 14 foot cab on an enclosed 10-foot tower. The 1935 structure was replaced in 1977 with a very simple wood cab resting on a concrete block 10-foot base. The lookout was closed in 1977. The catwalk was removed, and the cab was stripped and sealed, but still stands. 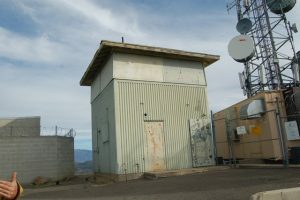 Red Mountain is now a major communications site and is visible to the west of Interstate 15, just north of the Mission Road exit to Fallbrook.